As promised, I return with the news and photos of my new kitten, Jazzmin, just seven weeks old, and the newest member of our family! After the loss of my beloved Lucy Rose around Easter time this past year, the hole in my heart was big, and I needed another feline friend. 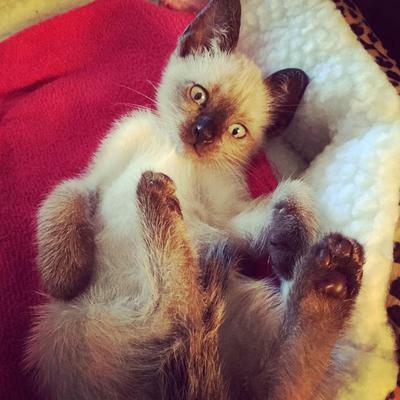 I learned of a litter of Siamese kittens in a nearby town, and made arrangements to become a kitten "Mom" when the kittens were old enough to be adopted into new homes. This happened for me last week, and I cannot express how much joy this little girl has brought into our home! Our older male Siamese, Ransom, is still in doubt about it, but at least he is not aggressive towards her, just avoiding her right now. I hope in time they will become friends. 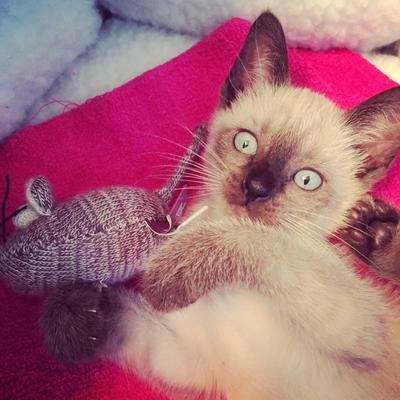 Jazzmin's mother was a chocolate point Siamese, and her father a seal point. I do not know exactly what to expect from her coloring as she grows and develops, but her nose seems dark enough to assume she is a seal ... perhaps a light seal. All in all, the house is brighter and her life and energy are lighting everything up around her! Note from Caroline: You can read Donna's memorial to her former cat, Lucy Rose, here. Donna, thanks so much for sharing your photos and news of Jazzmin with us. She's so cute, still has her 'kitten fluff' and she looks like a bundle of joy and fun. I hope she's settled in and is now friends with Ransom! 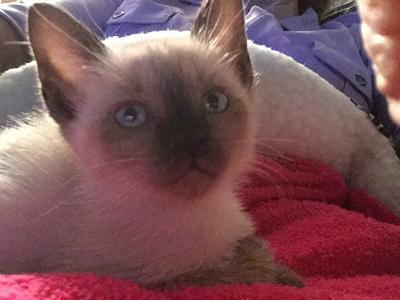 In terms of her coloring, time will tell, but I think you may be right and she's a seal point - her paw pads in the 'Playful Jazzmin' photo do look dark enough to be seal point.